Bart Ehrman’s Misquoting Jesus seeks to fill a market niche by being a book written for people who know nothing about textual criticism. Here it is reviewed under five headings: Synopsis, Praise, Critique, Conclusion, and Appendix. Introduction (pp. 1-15). Ehrman explains why the subject of the text of the New Testament is one that has radically affected him both emotionally and intellectually. He was brought up in a ‘churchgoing but not particularly religious’ family (p. 1) but in teenage years felt a kind of loneliness (which he now thinks was just what all teenagers feel). After becoming involved in a Campus Life Youth for Christ club he had a ‘born-again’ experience aged 15 and some time after that was encouraged to attend the Moody Bible Institute in Chicago, which he did in 1973. This institution held to biblical inerrancy and that the words of the autograph were inspired, but in an early class he encountered the fact that we do not possess the autographs, only ‘error-ridden copies of the autographs’ (p. 5). This got him interested in trying to learn about textual criticism. By the end of his three-year diploma at Moody he wanted to become ‘... an evangelical “voice” in secular circles, by getting degrees that would allow me to teach in secular settings while retaining my evangelical commitments’ (pp. 5-6). He went to Wheaton College, majoring in English and learning Greek, and there he experienced some doubts. After two years he went to Princeton Theological Seminary, where he studied with Bruce Metzger. He writes, ‘A turning point came in my second semester’ (p. 8), during a course on Mark when he had written a paper trying to justify the name ‘Abiathar’ in Mark 2:26 and his professor, Cullen Story, wrote thereon ‘Maybe Mark just made a mistake’. Once Ehrman had concluded that he did, ‘the floodgates opened’ to admitting other problems in scripture (p. 9) and then to having a radical rethink of his understanding of the Bible. He now writes a book which he believes is the first of its kind: a book ‘for people who know nothing about textual criticism’ (p. 15). 1. The Beginnings of Christian Scripture (pp. 17-43). Judaism was a religion of the book and writing became important within Christian churches through such things as Paul’s letters, pseudonymous letters, early gospels, acts, apocalypses, church orders, apologies, martyrologies, antiheretical tractates and early Christian commentaries. A canon began to form and people began to ascribe to New Testament writings the authority already ascribed to the Old Testament. In response to Marcion, the ‘Orthodox’ sought to delineate the canon’s boundaries. Despite the importance of writings for the churches, literacy was not common and there was consequently an emphasis on reading texts out publicly. 2. The Copyists of the Early Christian Writings (pp. 45-69). All texts in the ancient world needed to be manually copied and the difficulties involved in copying are presented by considering the narratives about books in the Shepherd of Hermas 5.4 and 8.3. At the earliest stage Christian texts were not copied by professional scribes and, accordingly, references to miscopying in Origen, Irenaeus and Revelation 22:18-19 are explored. Even if scribes only occasionally changed texts, changes were permanently introduced into the manuscript tradition. If Paul sent multiple copies of the letter to the Galatians round the Galatian churches, how can we be sure that they were all the same? If you assume, for instance, that John 1:1-18 and chapter 21 were not originally in the Gospel, what would it mean to reconstruct the original text? The Pericope Adulterae (John 7:53-8:12) and the last twelve verses of Mark (16:9-20) illustrate that major secondary additions occur in the New Testament text. 3. Texts of the New Testament (pp. 71-99). As professional scribes took over from non-professionals the transmission of the New Testament became more controlled. A further stage of standardization was achieved through the invention of printing during the fifteenth century. Erasmus produced the first published Greek New Testament, but one with significant weaknesses. Subsequent editions of the Greek New Testament are considered. Mill, in 1707, based on variants from 100 manuscripts, showed some thirty thousand places of variation in the New Testament and thereby demonstrated a significant problem for those who attribute authority to the original text. The problem that Mill demonstrated, however, is relatively small when compared with our present situation when so many more variations in the New Testament are known. There are various types of change that take place in manuscripts. 4. The Quest for Origins (pp. 101-125). Over recent centuries various scholars have contributed to discussions on method in textual criticism and the theological significance of variation in manuscripts. Those treated here are Richard Simon, Richard Bentley, Johann Albrecht Bengel, Johann Jakob Wettstein, Karl Lachmann, Lobegott Friedrich Constantine von Tischendorf, Brooke Foss Westcott and Fenton John Anthony Hort. 5. Originals That Matter (pp. 127-149). Variants can be very important. Here are presented some variants that are crucial for the interpretation of a whole book. Judged by a process of weighing external and internal evidence Mark 1:41 originally said that Jesus was angry, Luke did not originally contain 22:43-44 and Hebrews 2:9 originally read χωρις θεου ‘without God’ rather than χαριτι θεου ‘by the grace of God’. These three variants are highly significant for the picture of Jesus that emerges from these books and yet, Ehrman notes, most of our modern translations are based on the wrong text in these cases. If the wrong text is selected a quite different picture of Jesus can emerge. 6. Theologically Motivated Alterations of the Text (pp. 151-175). Scribes in the early centuries of Christianity sometimes allowed theological considerations to dictate what they wrote. The early centuries were a time of intense competition between various groups and a group we may label ‘Orthodox’ generally won the day. Members of this group occasionally altered the text to preclude interpretations that they viewed as heretical. For instance, the reading θεος in 1 Timothy 3:16 was anti-adoptionistic. Other changes were anti-docetic or anti-separationist. 7. The Social Worlds of the Text (pp. 177-205). Three further categories of changes introduced into the text are considered. First, Jesus and even Paul, though still adhering to certain aspects of patriarchy, had promoted the role of women. A number of later textual alterations seek to restrict women’s roles. Secondly, some secondary alterations to the text were anti-Jewish. Thirdly, some secondary alterations to the text were apologetically motivated, to protect Christianity from certain criticisms brought forward by pagans. Conclusion: Changing Scripture: Scribes, Authors, and Readers (pp. 207-218). ‘The more I studied the manuscript tradition of the New Testament, the more I realized just how radically the text had been altered over the years at the hands of scribes, who were not only conserving scripture but also changing it’ (p. 207). The changes in the New Testament make it impossible to believe that God inspired the original words. My summary: the book’s purposes are (a) to introduce laypeople to New Testmant textual criticism and (b) to disprove the divine inspiration of the New Testament. There are a number of strong points in this book. First, we may note that the material is all basically mature. Ehrman has been publishing in this area for some while and therefore for almost every variant he discusses in this popular treatment he can refer us to a more detailed and technical treatment of his elsewhere. His treatment is not superficial and every variant is dealt with instructively. Secondly, Ehrman shows the importance of variants and that many of these cannot be lightly dismissed. He has done everyone a service in presenting us with a strong case for many of the variants he chooses to take as earlier. Thirdly, the book makes some important connections that are often not made. It denies the authority of scripture by arguing against verbal inspiration, thereby agreeing with evangelicals that authority requires verbal inspiration. Fourthly, it is a good read. Fifthly, the pictures are nice. Nevertheless, this important book cannot escape criticism and this can be made for a number of reasons. 1. Lack of emphasis on manuscripts. For an introduction to textual criticism this book has a rather low emphasis on manuscripts. Though a number of manuscripts are referred to, the readers are in general kept at some distance from manuscripts, while there is much discussion of variant units. 2. Uncertain analysis of variants. It is hard to begin to discuss treatment of variants within this book without referring to Ehrman’s more technical discussions of the same variants. This would involve basically reviewing much of Ehrman’s scholarly work. 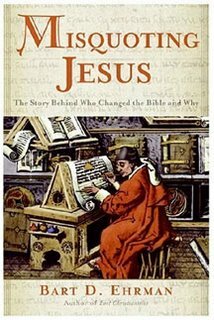 Rather I will here raise broader issues about how one decides between variants: first, it must be remembered that for many variants Ehrman discusses he does not dispute that modern Bible translations are based on the earliest available form of the text. For all the other cases, i.e. where the text that Ehrman claims is original differs from that behind modern Bible translations, it would be possible to find a number of top textual scholars who agreed with and a number who disagreed with Ehrman’s analysis. We may therefore ask how many of Ehrman’s analyses need to be right for his portrait of New Testament transmission to be right. What if only 75%, or even 50% or 25% were correct? Actually, for Ehrman’s overall analysis to be right he needs a very high proportion of his analyses of variants to be right. For many of the types of changes he gives but a few examples, and these are the ‘best’ examples. If he is wrong just a few times then a ‘type of change’ may be almost non-existent. Ehrman is strangely certain about the correct explanation of the variants in almost every case. There are some positions on the overall transmission of the text that allow textual critics to be relatively certain about what is original. For instance, if one has a high view of the reliability of one particular tradition (e.g. the Alexandrian or Byzantine) or of one particular manuscript (e.g. Vaticanus) then it is intellectually consistent to reach a high degree of confidence about what is the earliest available form of the text. Similarly, one might construct a stemma showing the genealogical relationship between manuscripts, or one might have another theoretical way of reaching confidence about the earliest text. One might even have a theological reason for certainty about the text. Whatever the merits of such positions—which cannot be explored here—they can be methodologically consistent. I would maintain, however, that, if the history of textual transmission is as Ehrman maintains it is, then it is really rather unreasonable of him to be so certain that his reconstruction of the earliest forms of the text are correct. If there were scribes who not infrequently introduced alterations into their texts, and the changes they introduced were capable of spreading across almost the entire range of manuscripts available to us, then we must be rather uncertain of what the earliest form of the text is. At one level this is what Ehrman himself maintains. And yet time and again Ehrman claims to be able to tell us what is earlier and what is later, and something of the theological convictions and motivation of those who introduced a variant in the text. The text he prefers may sometimes be in the mass of Alexandrian witnesses and may at other times be only attested in late manuscripts. At times it will be a difficult reading while at others a difficult reading is rejected. The one thing, however, that does run through most of the discussions of variants is Ehrman’s historical reconstruction of what scribes thought, how they were motivated, and how they acted in an environment of theological debate. Yet, the historical reconstruction is not some datum, but something itself supposedly derived from the manuscripts. This derivative construction has been given decisive authority, just as another textual critic might give decisive authority to a manuscript. Clearly, however, the construction needs its own verification before it can be given such decisive weight. 3. Misunderstandings of Concepts of Inspiration. The book is in some ways framed as an argument against divine verbal inspiration of the scriptures (a core historic evangelical belief, as well as one found widely in churches that are not evangelical). Nevertheless, it contains a number of statements that either misunderstand or misrepresent standard expressions of inspiration. One might well ask why this is the case. It might be, of course, that those evangelicals with whom Ehrman had contact as he was working through the question of inspiration did not correctly understand or present standard positions on inspiration. Yet, whatever the reason, Ehrman is now a mature scholar and should not merely engage with the non-intellectual expressions of evangelicals he happens to have encountered, but also with the ablest exponents of verbal inspiration. He has not, and the result is often unsatisfactory as will be seen as a few passages below are discussed. I kept reverting to my basic question: how does it help us to say that the Bible is the inerrant word of God if in fact we don’t have the words that God inerrantly inspired, but only the words copied by the scribes—sometimes correctly but sometimes (many times!) incorrectly? What good is it to say that the autographs (i.e., the originals) were inspired? We don’t have the originals! We have only error-ridden copies, and the vast majority of these are centuries removed from the originals and different from them, evidently, in thousands of ways. The premise seems to be that we do not have the words that God inspired, but Ehrman has produced little evidence that this is ever the case. He has shown that there are variants in the manuscripts, but unless he is prepared to show that none of the variants in the manuscripts is correct (and he does not do this), then he has merely shown that anyone believing in the divine inspiration of scripture would also have to believe that many New Testament manuscripts have lost divinely given words and replaced them with words that were not divinely given (which is hardly going to worry anyone provided this has not occurred in the whole manuscript tradition). It might be correct to say that such and such a scribe in history ‘did not have’ the divinely given words, but this cannot be converted into a statement about what ‘we’ have. The phrases ‘... we don’t have the words that God inerrantly inspired, but only the words copied by the scribes’ introduces a rather strange dichotomy. After all, these words are generally the same. Since it is the words that are inspired, not the ink, words do not lose inspiration by being copied. As for the sentences, ‘What good is it to say that the autographs (i.e., the originals) were inspired? We don’t have the originals!’, these are extremely strange. ‘Autographs’ and ‘originals’ as used here by Ehrman clearly mean material entities, i.e. actual manuscripts. Now, while I’m sure that many evangelicals have talked of ‘inspired autographs’ and the like, it has never been evangelical doctrine, or the doctrine of another group in Christendom, that any material was ever inspired. The text, which is immaterial, is inspired, and this text is recorded on a material. However, that text is neither more nor less inspired when written in the manuscript autograph or on a CD. The inspired words are therefore not lost when the originals are lost. The final sentence of this section uses the rhetorically-laden phrase ‘error-ridden’ (completely undefined) and observes that the majority of manuscripts are centuries removed in time from the autographs (which is irrelevant unless one attaches authority to numbers of manuscripts). ... it is a very complicated business talking about the ‘original’ text of Galatians. We don’t have it. The best we can do is get back to an early stage of its transmission, and simply hope that what we reconstruct about the copies made at that stage—based on the copies that happen to survive (in increasing numbers as we move into the Middle Ages)—reasonably reflects what Paul himself actually wrote, or at least what he intended to write when he dictated the letter. In this context ‘original’ refers to a material entity. Ehrman conjectures that there may have been multiple copies sent to the Galatian churches and that these would have differed in text. One could equally conjecture that there was a single autograph containing only one original text. Of the ‘original’ text Ehrman asserts: ‘we don’t have it’. If he is referring to the material of the manuscript then the answer is naturally, ‘so what?’ If he is referring to the actual verbal sequence contained in the earliest manuscript then Ehrman has a lot more work to do to make his case. Take, for instance, the first 100 letters of Galatians as given in any Greek New Testament. There is no reason to suppose that these letters differ in any way from what the original scribe wrote. Of course one cannot ‘prove’ that the original scribe wrote these—one could never ‘prove’ anything about an original scribe. But believers in divine inspiration do not need to ‘prove’ their belief to be true; they only need to be able to show that it is reasonable and to be able to show grounds of some kind that warrant that belief. In fact, there is no case in Galatians where we need suppose that a single letter written by the original scribe is not preserved in one of a relatively small number of Greek witnesses. Throughout this work, and particularly in the final chapter, Ehrman uses terms in an ill-defined way. The words ‘change’ and ‘alter’ are used in different senses and the words ‘scripture’, ‘text’ and ‘Bible’ are also used in more than one sense. The phrases ‘mean different things’ (p. 212) and ‘not saying the same thing’ (p. 214) are also used rather loosely. Clearly scribes may produce a text which is altered by being different from the text that they received. They may also alter what was written in a manuscript (by an addition or erasure). But in most cases scribes doing this do not alter ‘the text’ if by ‘the text’ we mean something that we now consider ‘the text’ of the New Testament. Ehrman has presumably opted for the ill-defined expression ‘change the text’ rather than a precise expression like ‘introduce a new variant reading’ for rhetorical reasons. When I was a student just beginning to think about those fifteen centuries of copying and the vicissitudes of the text, I kept reverting to the fact that whatever else we may say about the Christian scribes—whether of the early centuries or of the Middle Ages—we have to admit that in addition to copying scripture, they were changing scripture. Sometimes they didn’t mean to—they were simply tired, or inattentive, or, on occasion, inept. At other times, though, they did mean to make changes, as when they wanted the text to emphasize precisely what they themselves believed, for example about the nature of Christ, or about the role of women in the church, or about the wicked character of their Jewish opponents. In the first paragraph the first reference to ‘scripture’ refers to what the scribes held to be scripture. The second occurrence refers to ‘changing scripture’, which more often than not refers to the process whereby a second version of a text is produced alongside the first (which continues to be preserved in some copy). In the second paragraph ‘scripture’ seems to refer to ‘scripture’ as available to Ehrman. For Ehrman’s argument against verbal inspiration to be cogent it needs to mean that scribes had changed scripture before it got to Ehrman and that he thereby no longer had access to the original text. There is very little in this book that even attempts to show that we do not have the ‘original words’. To say that ‘the words God reputedly inspired had been changed’ must mean that the words are no longer available, which is not the case. He mentions that such words have been lost, but has not adduced evidence for this. This is a fairly unnuanced argument. Must all people have all of God’s word at every moment for it to be possible to believe that God ‘wanted people to have his actual words’? Or will it suffice to believe that God wanted some people to have some of his words for some of the time? Just what are the conditions that Ehrman is demanding for inspiration to be logical? He does not say. Ehrman’s whole emphasis here, however, is on human reception. Yet there is no need for reception of the whole of God’s word by the entire human race for it to function as his word. God may speak through a single verse that someone encounters, or through a single book of the Bible that has been translated into a particular language. Similarly, for us to insist on a perfectly printed version of the Greek New Testament bound under a single cover before we can believe that the text is inspired is a rather anthropocentric condition. We would also be insisting that scripture could only be verbally inspired for us in the twenty-first century if God fulfilled for us conditions that could not possibly have been fulfilled for Christians prior to the invention of printing. It is not irrational to suppose that God has not made his word available to all people at all times and places. Yet it is possible to maintain that in our time and place the whole original text of the New Testament is available in a relatively limited number of Greek witnesses. The final section of the book is a rather weak section on openness of interpretation: ‘The reality, I came to see, is that meaning is not inherent and that texts do not speak for themselves. If texts could speak for themselves, then everyone honestly and openly reading a text would agree on what the text says’ (p. 216). We are presented with an all or nothing dichotomy. Either there is complete agreement on every point of interpretation, or else basic interpretative openness. Actually interpretations can converge. Ehrman knows this, and elsewhere he seems to presuppose a more restricted view of a text’s meaning. Here, however, he seems to be throwing just one more argument in favour of uncertainty to do with the New Testament. There is much that is true and correct in this book and which should cause constructive reflection amongst those who believe in the verbal inspiration of Scripture. Many of the discussions are also highly debatable from a historical angle. The book engages in a theological subject, but often fails to make vital distinctions in treating theological positions. Consequently, although it is a book from which one will learn much, it is better treated as a repository of information than as a model of argumentation. This critique of Ehrman’s has been made without disputing the various discussions of variants. Perhaps this can take place at a further stage of review. A review of major textual critics in recent centuries, such as is undertaken in chapter 4, really must include a separate section on Griesbach. The Hebrew on the dust jacket is upside down. ‘Desiderus Erasmus’ should read ‘Desiderius Erasmus’ (p. 70). The phrase scriptio continua is twice miswritten as scriptuo continua (pp. 48, 90). Despite the comments on p. 91 the normal nomen sacrum for πνευμα is not πμα but πνα. This causes problems in the statement with relation to 1 Corinthians 12:13 ‘The word Spirit (PNEUMA) would have been abbreviated in most manuscripts as PMA, which understandably could be—and was—misread by some scribes as the Greek word for ‘drink’ (POMA)...’ (p. 91). The next paragraph contains the following ironic sentence: ‘This kind of mistake is called periblepsis (an “eye-skip”) occasioned by homoeoteleuton (the “same endings”). I teach my students that they can lay claim to a university education when they can speak intelligently about periblepsis occasioned by homoeoteleuton.’ (p. 91). Twice the author means ‘parablepsis’. Codex Sinaiticus does not support the presence of ‘and he was taken up into heaven’ (Luke 24:51) despite the rather confused assertion on p. 169 that it does. P. 192 should refer to Acts 17:30 not 17:27. The claim that reading ORGISQEIS in Mark 1:41 radically changes the picture of Jesus in the Gospel of Mark doesn't stand up to close examination. Ehrman's project to deconstruct evangelicalism, starting with the doctrine of scripture, relies on exaggerations like this one. The idea that evangelicals should be scandalized by ORGISQEIS in Mark 1:41 is without merit. Both Lane (Mark NICNT 1974) and France (Mark NIGTC 2002) argue for reading ORGISQEIS in Mark 1:41. No scandal here. Ehrman has chosen as his target for attack, a very rigid form of fundamentalism which seeks mathematical certainty in matters of NT text. This sort of target is very easy to attack. It is precisely because some evangelicals favour the readings that Ehrman prefers that I have not sought to critique his argument on the basis of his preferred readings. Nevertheless, I do not find οργισθεις compelling. There are too many possibilities for accidental corruption—it could even be a retranslation from Latin iratus from misertus. However, I would aspire to certainty about the text. I do not see such an aim negatively. Hi, interesting discussion, thanks for posting this. Personally I feel that Bart Ehrman has simply taken 'modern scientific textcrit' to its ultimate unravelling, especially in his (correct) view that an "inerrancy in the original autographs" is not a true inerrancy at all. This is a modernist view of inerrancy that came to prominence in the last century, post-Reformation. One question on the commentary. What are the "mass of alexandrian witnesses" ? Are scraps of textually diffuse papyri being considered a mass of witnesses ? If not, how many manuscripts comprise this mass ? "However, I would aspire to certainty about the text. I do not see such an aim negatively." The kind of certainty you aspire to isn't the kind of certainty I am talking about. To really understand what Ehrman is attacking one probably needs to have first hand exposure to street level american fundamentalism of the kind he was exposed to in his teens and early college years. Ehrman knows his target well. It has been a long time but I remember the bible wars of the late 70s when Earl Radmacher, D.A. Carson and a long list of others hammered out carefully nuanced statements on all of these issues. Ehrman is banking on the fact that is target audience will be too young to know about this. Ehrman's claim that the nomen sacrum for πνευμα was πμα would not be as problematic had not Ehrman made *exactly* the same error in his revision of Metzger's Text of the New Testament! I can only conclude that Ehrman's intention in claiming πμα must be deliberate. As noted, Ehrman's claim regarding 1Cor 12:13 depends upon this false identification. In fact, the few minuscules that read POMA (630 1510 1881 al) more likely simply confused the *minuscule* continuous text form of πμα with the word πoμα (compare any minuscule MS to see the point). I thank you for your critique of Ehrman's work, and find your assertion that "divine verbal inspiration of the scriptures (a core historic evangelical belief, as well as one found widely in churches that are not evangelical)" seems to me to be the very core of the problem. (1) As a professor at a very conservative evangelical university, I would suggest that your assertion is false if applied to ALL evangelicals. Not all evangelicals hold to verbal inspiration; only the most conservative (and vocal). (2) A misunderstanding of "inspiration" seems to be the key factor that prevents us as conservative evangelicals from really understanding the nature and function of the biblical text. If we continue to hold that God spoke and the little red letters fell from His lips and into the text, we will never make significant progress in understanding the full character and nature of the Word. I would suggest we need to take a stronger look at the neo-orthodox understanding of the Word as an operative that lives and stirs us to a divine encounter and response rather than a purely inscribed Word and verbum that is communicating only one static truth. In that sense, Ehrman as you describe him has done us a service by pointing out that the text is a living interpretation of the magnalia dei that was and remains fluid enough to transcend culture, doctrinal discourse, and any other assault and still remain the Verbum Dei. thank you very, very much for this review. Ehrman's early view of inspiration was based on a "constructed" view of inspiration, vs. that only the autographs are inspired. I think we have to overcome this false idea. If there is really a God who inspired the NT, he should have been aware of the fact that after some years, no manuscript will look like another. So, inspiration must be based on s.th. else than on the autograph (which got lost anyway) or on an artifical, reconstructed autograph. A certain tolerance must be allowed. And, as so often, inspiration in Ehrman's early view was too much based on the text itself, while the NT bases inspiration much more on the effect scripture has on man (2Tim 3:16). That does not mean that variants are irrelevant - the best text HAS to be ascertained - but neither does it mean that a certain (after all quite small) amount of variants (or, uncertain text) can delimit the power of the text. The greatest movements in church history were based on a rather bad text(Wycliffs Reformation - based on the Vulgate; the German Reformation - based on Erasmus' text). In his apologetic for the denial of verbal inspiration, Ehrman compared the inferiority of modern versions of the Bible to the originals with the inferiority of black and white TV to color. I think the analogy is pretty good. But then, if God had chosen to give His Word in the form of a color TV show, and if the Church found herself centuries later with nothing other than black and white copies of the show with varying degrees of quality, the situation would have some similarities with the Bible we know. Fundamentalists like those Ehrman knew at Moody would be fully justified in upholding the inspiration of the original they don't have. They would also be fully justified in reverently studying the copies they do have as the Word of God. And scholars would be justified in pursuing a version as close as possible to the original by correcting the errors of some copies in light of the information preserved in others. Steven Avery wrote: 'Bart Ehrman has simply taken "modern scientific textcrit" to its ultimate unravelling'. It is hard to conclude that he has taken it anywhere unless his arguments are more compelling. He does nothing to demonstrate conclusively that one cannot view transmission as having been less tendentious. If you think that the neo-orthodox expression of inspiration is good then why don't you simply say that you are a neo-orthodox evangelical? This nomenclature will simplify things. I suggest that the phrase 'conservative evangelical' (even though I don't generally apply it to myself) is not allowed to be simultaneously applied along with 'neo-orthodox evangelical'. I should be extremely interested if you could find me any evangelical (whether self-designated or so designated by others) from before 1900 who articulated a view of inspiration that denied verbal inspiration. If you cannot then I think we should assume that belief in verbal inspiration was the 'historic' position of evangelicals. I would urge you to try to make 'progress' by exploring neo-orthodoxy while designating yourself with some label involving the term 'neo-orthodox'. Those who believe in verbal inspiration and are evangelicals should seek to make similar 'progress', while seeing their position as 'historic' within evangelicalism. In a couple of decades we can then compare notes and see who has made the most 'progress'. This blog is about making 'progress' within a confessional attitude committed to the view that there is a finite and specific group and sequence of words, co-extensive with scripture, which God may be said to have 'authored'. The means of inspiration is not defined, merely the product. I agree with the first half of your message. Ehrman here was in the company of a huge number of evangelical theologians. We should not allow, however, a dichotomy to emerge between the text and its effects. In 2 Tim. 3:15 we have the rather striking phrase ιερα γραμματα 'sacred letters', which speaks of written signs as having a property that is derived from God. It is actual letters (correctly sequenced and understood) that are a necessary cause for the effect described in the following verse. It is a tribute to the power of the text that such a lot can be achieved through something that is, say, only 95% accurate. However, when applying the adjective 'bad' to Erasmus' text we must remember that we are using the adjective in a relative sense. thanks for your reply. Of course, I am not propagating a sort of existentialism - as if the word of God becomes only the inspired word when an interaction between the word (or God) & man is happening. To express my view more positive than negative: I believe that the text we have today is not less inspired than the autographs. I do not believe we have to make that hair-splitting distinction between an inspired autograph (which nobody ever had except the author and the first copists)and between less-inspired or inspired as-dervied-from-the-autographs copies. Copies are as inspired as the autograph, if the variants do not change the basic meaning of the text. The early church, judged e.g. from the writings of Irenaeus and Origen, seems to have had a similar view: they had no problems in citing this or that variant from the same text, as long as the basic meaning was not touched. You have the same with the OT-citations in the NT. It may be dificult to decide when the basic meaning is touched. The early church condemned Marcion for crossing boundaries, we might do the same with the Watchtower Society etc. The task of Textual Criticism is to keep the text as pure as possible. One way to reach this goal is to reconstruct the most original text. Another way is (or was, e.g. in the Byzantine church) to copy the text as meticously as possible. Usually, we try to combine both methods today. With these methods, the text and its inspirational potential can be kept alive. Thanks very much for your review of Ehrman's work. I'm grateful also for this blog in general. I picked up Ehrman's work a few days ago and worked through a good bit of it with B Metzger's Textual Commentary in my other hand. It was an interesting, even bracing read, without a doubt. But nothing in the work will take learned evangelical scholars/thinkers/ministers by surprise, it seems to me. One part of the book that I found challenging was his short list of potential contradictions/errors in the NT (pp.9-10). One of them contrasts Matthew's and Luke's handling of the infancy narratives, focusing on the fact that Matthew speaks of Jesus' flight to Egypt, while Luke makes no mention whatsoever, and has the family returning to Nazareth. Any thoughts on how to best reconcile/understand this apparent tension? To me, 'text' = immaterial; 'autograph' = material. The autograph is not 'inspired' unless we use this as shorthand for 'the text inthe autograph is inspired'. When autograph and copies are defined as material then neither an autograph nor a copy is inspired. There is therefore no distinction to be made. The text (i.e. the words) is inspired. 3. 'Copies are as inspired as the autograph'. But, for me, neither are inspired. We do have evidence that early church fathers who were aware of variants would accept one and reject others. Some they accept as words of God and others not. The second occurrence of 'text' here generally refers to a large-scale entity because it occurs with the term 'reconstruct'. For small variant units I would say that the term 'reconstruct' does not adequately depict the editorial process whereby modern editors select between sets of wording preserved within manuscripts. I'm trying to understand your distinction between text as immaterial and autograph as material. With this distinction in mind, I guess my question involves how presicely you think that we have access to the immaterial text (i.e. inspired words)? Did a perfect copy of the inspired words ever come into physical, material existence (attributes usually given to the autograph)? (I have to admit that I did not take the time to carefully select every word I used), though I wonder where you see - or how you can keep apart except in your mind - the difference between the text on e.g. a papyrus (as material) and the words in it (as immaterial). You can't see, read, handle etc. the one without the other. But perhaps, as a philologian, I am too simple-minded for this distinction. Let me refer to just one point in addition. You said, "We do have evidence that early church fathers who were aware of variants would accept one and reject others." That is true, but especially in the 2nd and 3rd century, it seems citing without caring much for smaller variants is the usual habit (cf. B.Aland in the publication of Horton, JSNTS 258, p. 118ff., you reviewed recently). Only later, even smaller variants were taken more seriously (sometimes too seriously; cf. the old work of Bludau, "Die Schriftfälschungen der Häretiker", who came to a conclusion totally different from Ehrman's in his "Orthodox Corruption"). "from mouth to mouth" (3John 14). A text can exist without material representation, especially in an oral culture. Just to deal with the matter at its most abstract: a text could be recorded on a physical material, e.g. papyrus, stone, metal. It might also be recorded in mind/memory (human or divine). Yet I would not say that the inspired text has ever lacked material representation, though there is nothing objectionable in principle to the idea of an inspired text with no material representation. In Islam the Qur'an is usually conceived of as immaterial text before its 'descent'. Christians have, I believe, historically held that the inspired words (immaterial) could be accessed through accurate material copies. Immaterial and material are connected, in that, except in oral settings, our access to the text is through representation of information by the arrangement of matter. However, generally in the OT (which I believe provides a model for Christian doctrines of the inspiration of the NT) the entity that is said to come from God is immaterial 'words'. The words of God exist apart from physical instantiation: thus the Decalogue is not destroyed when Moses smashes the stones, and Jehoiakim's burning of the scroll (Jer. 36) does nothing to prevent the 'words of the Lord' (Jer. 36:8) from existing. The historic Christian belief about scripture is that it is entirely true, not that it contains no contradictions. Contradictions can be a useful device for writers, as when Dickens opens A Tale of Two Cities with 'It was the best of times, it was the worst of times.' John uses contradictions particularly effectively (e.g. John 5:31 vs 8:13-14; 7:28 vs. 9:29; 3:16 vs. 1 John 2:15). What would be problematic for classic Christian views of scripture would be if contradictions risked rendering scripture meaningless or untrue. But this certainly does not happen with John's use of contradictions. If we can recognise that a single human writer, such as John, may use contradictions effectively to convey truth then I see no reason why a divine author cannot use formal contradictions between two human writers to convey truth. Obviously there are contradictions that are incompatible with truth and those that are incompatible with truth. (1) 'Abiathar the high priest' (Mark 2:26). The most important thing for an evangelical textual critic to do on encountering such problems is to resist any temptation to change the text (personally I don't find this very tempting—but some do!). The next thing to do is to remember is that Christians are only supposed to believe that scripture is 'true', not that it conforms to standards that we have set for modern scientific, philosophical, and legal discourse. I say 'true' things to my 4-year-old daughter and to my first year Greek class. What I say is true even if, as often, I am aware that I am omitting very major relevant information on a subject. We should allow the Bible to do the same. In this light (1) looks slightly like Ehrman holds that the use of anachronistic titles is incompatible with truth. But writers for years have had no problem with statements like 'Jesse begat David the king' (Matthew 1:6), 'when Alexander the Great was a baby', etc. (David was no king when he was begotten, nor was Alex very great.) The burden of proof is on Ehrman to show that the statement in Mark 2:26 could only be perceived as being true if επι with the genitive word for high priest (cf. Luke 3:2) could only be true if the person with the following name was actually in office at the time. I'm not sure that much linguistic research has been done on this question. I should be interested to know what 'true' alternatives Ehrman would propose to what Mark wrote. (2) shows that Ehrman presupposes that hyperbole is incompatible with truth. Do we really want to call everyone who uses hyperbole a liar? I've used it billions of times. (3) is a problem, but the chronology of the time is also a subject about which we are rather ignorant. Commentaries should be consulted. Ehrman seems to be using a problem like this as a means of deciding between a paradigm in which the Bible is entirely true and one in which it is not so. To do this we should not use arguments that could very easily be overturned by future discovery. (4) is definitely based on the assumption that a 'true' account cannot take the liberty of omitting major relevant information, while creating a seamless narrative that gives no indication of an omission of information. Yes, there is a formal contradiction here between Matthew and Luke, but so what? That does not mean that both narratives are not entirely true. As for (5), I take it that Gal. 1:18 refers to the same meeting as Acts 9:26 and that Paul and Luke agree that Paul did not immediately go up to Jerusalem after his conversion. The 'three years' (possibly a period as short as parts of three years) of Gal. 1:18 are hardly incompatible with 'some days' (Acts 9:19 - ignoring P45's 'many days') + 'many days' (Acts 9:23) + the time when the city was guarded (Acts 9:24) + the time to get to Jerusalem (Acts 9:26)—his flight need not have been by the most direct route. These comments are offered as a special concession. I do not intend to get into the business of trying to defend or discuss the truth of various statements in the Bible. That is the business of other blogs and discussion groups. Ehrman exaggerates the problem for verbal inspiration posed by textual variants. However, there seems to be no way to avoid some level of residual uncertainty about the original reading in a minute fraction of the NT text. So what should I say to a 21 year old bible student who asks about Ehrman's argument? The stock and trade answer, no doubtful reading places orthodox theology at risk, leaves Ehrman's objection essentially untouched. I would like to see a more aggressive deconstruction of Ehrman's project. Why should we let him go on year after year publishing these books without a substantive and devastating reply? Someone with a orderly logical mind needs to show us why Ehrman's argument that uncertainty about some readings in the NT text does not render useless the notion of verbal inspiration. I have been looking on the web for an answer to this and all I can come up with is the textbook stuff I was taught 30 years ago in seminary. Didn't K.Aland announce sometime in the last decade or two that we now have the NT in the original greek? Has the NT text presented in UBS3/NA26 been altered in the last three decades? This makes me want to smile, guffaw, fall off the chair laughing, when Ehrman goes on "Fresh Air" and says that he cannot place his trust in an inspired document which we do not have. If we don't have the text GNT then we don't have any ancient text. Thanks for the excellent critique showing how Ehrman does not prove that the original words of the NT have been lost most or even some of the time. Of course the premise behind conjectures is that such is the case on occasion. Does anyone know if Ehrman has a list of original-restoring conjectures where he believes the entire MS tradition has gone wrong? You have me rather confused. You seem to be saying that you are "open" and exploring, but you fall back on defending pre-1900 evangelicalism as some paragon of example. Remember, those pre-1900 theologues that defended their view of inerrancy are also part of the crowd that defended lynchings and segregation. *Yawn* I stubled into another fundamentalist blog masquerading as academe. Sorry. I'll leave....My bad. Ichabod. Thank you for an excellent review and critique of Ehrman. Very helpful, indeed. I plan to link to this and recommend it heartily. I probably should point out that I agree with those who think PJ wrote a good review. In fact it could serve as a model of how to write a review. Further more, I would really like to see a sort of James Barr job done on Ehrman's project, not just this particular book but his on going program of trying to discredit the text of the Greek NT. I think it would be worth the trouble for a professional TC scholar to take this on. DM said: "I would suggest we need to take a stronger look at the neo-orthodox understanding of the Word"
To borrow a favorite phrase of Larry Hurtado's "It's been done". Fuller seminary started exploring neo-orthodoxy in the early 60's and a lot of good professors packed their bags and went elsewhere. I personally spent three years reading Brunner in preparation for a thesis on his understanding of revelation as divine human encounter. So I guess you could say I took a strong look at it. No you didn't wander on to a fundamentalist blog. You wandered on to an orthodox blog. I like this blog. I was just thrilled to death to find it. Sorry for causing confusion. I do not see why one cannot simultaneously be both 'open' and 'exploring' and 'defending' simultaneously. Perhaps you could explain why you see these as fundamentally incompatible. If I may clarify what I was basically saying to you—if we think that we need to make 'progress' then I see no reason why there should not be two groups of people separately working on the system of belief they believe to be most likely to deliver that progress. I happen to believe that working within an understanding of scripture as consisting of words that may be said to be authored by God is the best way to make such 'progress'. It appears that you do not. May we each come to know our Maker better as we refine our own positions. As for the mention of lynchings and segregation—you seem rather sweeping in your general association of a belief about scripture and particular activities. If particular groups have erred then name them, but don't tar all with the same brush. It was William Wilberforce who, with his commitment to verbal inspiration, campaigned for the abolition of slavery. I don't know much about the history of the USA, and so cannot comment about it. But since most of the members of this blog are European and belong to churches that have historically believed in verbal inspiration but not lynchings or segregation it seems that it is not possible to make any causal link between one view of scripture and such negative phenomena. I agree that Ehrman needs some more substantive reply. However, we should not be tempted into any premature reply. Evangelical textual criticism is not, in my view, currently in a very good state. This is partly because we have been too content with cosy, but not ultimately satisfactory, replies. There is no easy cut-off between 'doctrinal' and 'non-doctrinal' variants since, in historic evangelical theology, history and doctrine are linked. Ehrman is only able to make his argument so plausible because he begins from an existing consensus about textual criticism that is itself not particularly conducive to evangelical belief. A deconstruction of Ehrman's "project" and his denial of verbal inspiration due to uncertainties about readings is one thing, and a deconstruction of his thesis another... The best way is to start with his thesis about conscious doctrinal changes early on in the transmission history, and here it is possible I think likewise to "begin from an existing consensus about textual criticism" (like Pete said about Ehrman's starting point). I have myself written about P72 and the unquestionable theological tendency of that scribe, but personally I see him as an exception. "Evangelical textual criticism is not, in my view, currently in a very good state. This is partly because we have been too content with cosy, but not ultimately satisfactory, replies." I totally agree. That is why I am not happy with the apologetics style answers that I was taught in school thirty years ago which seem to still be in use. Apologetics is, of course, a legitimate activity. I've often engaged in it myself. Part of the problem seems, however, to be that apologists like to function by persuading their audience that the belief system they advocate is one with no problems (are there really any such belief systems?). This seems to help get them into the fold (we are not in a position to say what happens in eternal terms), but also ensures that they will never carry out research. There is nothing likely to stop research so quickly as the idea that everything is alright now. However, we should not let others off the hook too quickly. There has been a general decline in detailed textual research. I don't think that evangelicals are to take the blame for this. Some other prevailing thought systems must be responsible. I just wanted to say thank you for your responses on the four or five potential errors listed by Ehrman, Misquoting Jesus, p.9-10. Your comments were quite insightful. By the way, Craig Blomberg gives a helpful reading of the passover chronology in John's Gospel in his Historical Reliability of the Gospels, but you may know that. Thanks for mentioning this. Yes, I've read Blomberg's book and find much of it, including its discussion of the passover chronology, useful. There are also other possibilities. This is a little confused I think. It was Fell's edition (1675) that was based on 100 manuscripts (T¯es Kain¯es Diath¯ek¯es hapanta Novi Testamenti Libri Omnes, Accesserunt Parallela Scripturae Loca, Nec Non Variantes Lectiones ex plus 100 MSS. Codicibus, et Antiquis Versionibus Collectae; Oxford: E. Theatro Sheldoniano, 1675). It was later estimated (by Kuster in his revision of Mill) that there were around 30,000 variant readings collected by Mill. Nor did Mill demonstrate that these variants were a challenge to the authority of the original text (others did feel this challenge, from a Christian and a free-thinking perspective, but it doesn't seem to have been a big deal for Mill - the harder reading rule helped him!). As Bentley said concerning these variants (in defence of Mill): ‘Mill did not make and coin them, he only exhibited them to view’. to be more precise, Mill's edition was based on some 80 manuscripts(see Scrivener II, p. 203). it was estimated to have 30000 variants; later, it was estimated to reach up to 150000 (see Nestle, Einführung, 3,.Aufl. p. 16). Bart Erhman's journey has taken him from orthodox to liberalism to agnosticism. He has been theologically drifting throughout his career and now, his drifting has finally taken him to his most recent shipwrecked work, Misquoting Jesus. Bart was a classmate of mine at Moody in 1976. We attended the same courses, took many of the same teachers, and read the same texts. Yet, somehow he seems to have received a far different education that I received. You would think from reading his book that he never heard of textual criticism, hermenuetics and textual variants until his seminary years. That could not be more inaccurate. What Erhman does is to set up a strawman version of biblical authority and inerrancy and then attacks it with the same old arguments. Bart's goals were to once to be an evangelical voice in secular circles. Goals he alludes in the senior section of 1976 Moody yearbook. Hate to tell him, he failed. Unfortunately, he is determined to take others with him on his journey. Thanks for your most personal comment. This is an important testimony for exonerating your Alma Mater. Most of us are not in a position to judge whether, in speaking of Moody, Ehrman sets up a straw man or not. However, I think it is important for those of us who have not studied alongside Ehrman during his most formative period not to seek to analyse his formation psychologically. It is not even necessary for us to enter into spiritual judgement. Debate for most of us must focus on the validity of the arguments he uses now, not on the nature of his experience then. It is true that he has brought his own experience to public attention, and therefore made it a public issue. Nevertheless, focus should be on arguments not personalities. I concur that the journey from 'fundamentalism' and 'ultra-conservatism' is a key part of the narrative and rhetorical effectiveness of the book. You obviously have first-hand experience of Moody back in those days and feel able to testify that the education was more balanced than Ehrman presents. However, the force of the narrative is not merely in its truth, but in its believability. Clearly the narrative of a journey from 'fundy' to agnostic resonates with many people. The names Ehrman and Moody Bible Institute are not therefore essential parts of the narrative. The narrative feels like it could be retold with other parties involved. If you could exonerate MBI by your own testimony, or better still by public documentation (course material, statements of the faculty recorded at that time) this would be useful in highlighting the problems of Ehrman's own oral history. However, our wider task is to provide an environment in which a narrative like that of Ehrman either seems irrelevant, because it bypasses historic evangelicalism or unbelievable, because there simply are not environments such as Ehrman portrays. Roll on the Parousia! "Ehrman's claim that the nomen sacrum for πνευμα was πμα would not be as problematic had not Ehrman made *exactly* the same error in his revision of Metzger's Text of the New Testament!" Although I don't want to be viewed as a defender of Ehrman's approach in Misquoting...," it's only fair to him to point out that this mistake (p. 252 in 4th ed.) was already present in the 3d edition (p. 187)--so the mistake is Metzger's (even though Metzger has it right on p. 14, 3d ed.). It is also correct on p. 23 of 4th ed.--and in Metzger's Manuscripts of the Greek Bible, p. 36. So Ehrman's only error here is in not catching/correcting his mentor's error. I suppose, too, that we might ask if there are examples of πνευμα abbreviated as ΠΜΑ, despite the normal nomina sacra form as ΠΝΑ? In that regard, I don't know the answer. Perhaps someone else does? Metzger isn't the sort of scholar to make this sort of mistake and not catch it--esp. after a dozen years. I read with interest Ehrman's comment on 'scriptuo continua' on p. 48. In n. 5 he references Metzger's "Text of the New Testament" 4th Ed. Ehrman certainly gives the impression (through the illustration of 'godisnowhere' and what follows) that a lack of spaces between words causes much uncertainty in understanding a text and presumably copying it. But in checking Metzger's 3rd Ed. (I don't have access to the 4th) Metzger follows this familiar illustration with the sentence, "It must not be thought, however, that such ambiguities occur very often in Greek. The rest of his paragraph makes clear that reading 'scriptuo continua' was not rocket science. I wonder what Bruce Metzger thinks of this book by his former student. Two points. (1) Just to reiterate that 'scriptuo continua' is Ehrman's mistake. It should read 'scriptio continua'. (2) I would anticipate that Metzger would give generous support to Ehrman, despite differences of perspective and approach. Thank you for this review. Ehrman's story is interesting, although sad. His book is certainly being picked up on, online, as an attack on Christianity. Now if I understand the argument correctly, since all texts exist in an imperfect world and are transmitted imperfectly, Ehrman is also arguing against the possibility that an inspired text can exist. But surely those who composed and transmitted these texts were rather more familiar than we are with the problems in the manuscript era? In the same vein, we have no certainty as to what language Jesus used, and a fair degree of certainty that the NT is a translation. But I don't recall any of the fathers getting concerned about inspiration on this ground. Was there ever a stage when Christians did not think that a translation could also be inspired? Yet a translation involves perforce changing every word of a text; more change, in one sense, than any Greek text endures. I cannot help feeling that, even with a doctrine of verbal inspiration, the whole idea that it can be disproved by showing -- what we all knew -- that human beings live in an imperfect world, and make mistakes when copying things is itself a mistake. Of course this is very much a high-level query that does not engage with the detail of Ehrman's book, so I may be missing something here. For what it's worth, Metzger's 2nd edition of The Text of the New Testament also gives ΠΜΑ as the abbreviation for πνευμα (p. 187). Metzger gives the same reason Ehrman does for the variant in 1 Cor. 12.13 saying, "...[it] arose when scribes misread the letters ΠΜΑ (the usual contraction of the word πνευμα) as ΠOΜΑ ('drink')." Interesting read indeed. Some very good points, some more odd, but stil insightful. The maroon got to my eyes, but I got through it. Definitely gives me some pointers for future discussions on such matters. More than just the details, it's the style of debate and assertions of faith that I haven't had the courage to use. I'm allowed to, I've got the right. Like Bart Ehrman, I too went to Moody Bible Institute and experienced many of the same things. What an AMAZING school - such a blessing and privilege to be chosen to go there. If he only Mr. Ehrman would have realized that there were shortforms to names back in those days just like there are now - (Derivatives of names). i have to wonder --- i guess that throws that "THEORY" of his out the window. Sadly he's making up things to suit his own tastes and satisfaction. that Jesus Christ IS the only way to salvation and ETERNAL LIFE. (Life beyond this life on earth). I was fascinated by the book because of his honest search for answers. So many authors of practically anything put some sort of spin on the material. Dr. Ehrman didn't put any spin on his book which to me was obvious. However, I noticed in reading your review obvious spins and an expremely obvious effort to discredit him. Living by faith is ok, I too am a Christian; however, whevever anything is written in any book, articel , critical report wherever statements are made or written that is contradictory to what is known scientifically it is time to adjust one's beliefs. I have found that many times the religious community and certainly the fundamentalist community are locked into beliefs by faith and one cannot make any comments or make any points that are contradictory to those beliefs. I have learned that it is to no avail to try to convince a "flat earther" that the earth is round, or "some people" the "the big bang" is no longer a theory, or that the earth is older than 6,000 years. Anyway, may I keep learning, an open mind, and continuing to believe in My God and that there is a reason for our being here and that there is a need for the soul to experience our enviornment through the five senses to learn and grow. However, some are developing into a mulit-sense being which will further add to the spiritual growth in several ways. May God bless you. "To really understand what Ehrman is attacking one probably needs to have first hand exposure to street level american fundamentalism of the kind he was exposed to in his teens and early college years. Ehrman knows his target well." For the record, the schools Moody and Wheaton, while perhaps they were in the 70s, are by no means "street level american fundamentalism" today. The professors at Moody are first class scholars these days. I have learned that it is to no avail to try to convince a "flat earther" that the earth is round, or "some people" the "the big bang" is no longer a theory, or that the earth is older than 6,000 years. This is probably neither here nor there, but I would like to respond although it's off-topic. Likening "flat earther" to those who believe in a young earth is entirely a different debate altogether. Very miniscule sections of fundamental Christianity hold "flat earth" ideas. However, Young Earth is far more debateable, and is brilliantly illustrated when you evalutate trends in re-interpretation of the strata of the earth, and geological context, etc. The move from Uniformitarianism (Grand Canyon and things like it formed over very long periods of time) is being replaced by Neo-Catastrophism - Why? Because models that explain geological circumstances based on a world-wide deluge or other catastrophic events are proving far more tenable. Although you may not want to compare data or interpretive conclusions based on that data in a "scientific way," try www.icr.org and just compare some of the articles, and do the research. Young Earth has gained a lot of steam since the embarassing arguments of the 60s and 70s. If you want to remain with the same assumptions of "illogical Christian bible thumpers" which is no longer relevant to the largest body of evangelicals, however, be my guest. The Big bang is a non-issue - It was rejected for a long time by most scientific circles because the classical skeptic believed that the earth was eternal - the big bang forces an acknowlegment that the earth had a beginning, and because it had a beginning, much more research as to what that beginning was must be done. "It took time, observational evidence, and careful verification of predictions made by the Big Bang model to convince the scientific community to accept the idea of a cosmic genesis. Not only did the Big Bang model seem to give in to the Judeo-Christian idea of a beginning of the world, but it also seemed to have to call for an act of supernatural creation at some point." The Big Bang supported Judeo-Christian ideas about creation. That's why it took a while to stick. The fact that you accept Old Earth theories, apparently by faith, is that you are not critically evaluating data and the interpretations of that data (the critical problem in young earth/old earth debates) shows me that you have ipso facto accepted the old earth hypothesis. There's a problem. You have just accepted what scientists have told you purely on the basis of consensus and trust (faith) yet you are not accepting what others are telling you, simply because of the demonizing stigma they have gathered within the culture. You may never read this again, but honestly i'm confused concerning the statement i quoted at the beginning of this reply. Seriously confused. Again, I pray I do not derail a very good conversation, but I prefer to respond to claims such as this one and not leave them unanswered. Apparently you have not read stephen hawking. Ehrman speaks of the knowable truth which is all we really do have if we are being honest, as cold as it is to believers. It brings to mind the thoughts of a great existentialist. "Seeking what is true is not seeking what is desirable. If in order to elude the anxious question: 'What would life be?' one must, like the donkey, feed on the roses of illusion, then the absurd mind, rather than resigning itself to falsehood, prefers to adopt fearlessly Kierkegaard's reply: 'despair.' Everything considered, a determined soul will always manage." FYI - check out Ehrman's 'God's Problem' for more cold reality. And do yourselves a favor - START BEING HONEST WITH YOURSELVES! Ehrman scores a bulls eye strike to the heart of all who parade the ineherent "word of god" myth regarding the Bible as they know it. If faith was/were fact you wouldn't need it. Wow you did a lot of research on this.And this is an interesting discussion on evavelistic idea's. Keep up the good work, also I don't want to talk about or defend idea's here, but there's a lot to think about. "If faith was/were fact you wouldn't need it." It is the nature of truth/facts/reality to be in and of themselves dogmatic and consistent with God's Omniscience. Where faith/belief aligns itself with "fact" is where your knowledge of the truth is finally actual and without deception. "Faith" that is trusting in the Infinite Creator is logical to do. We argue over the details..but that doesn't change what the real Holy Word/Reason/Logic of God is. My major problem with Bart's criticism throughout Misquoting Jesus are his conclusions based on historical inductions. These inductions can be colored either way based on your trust of orthodoxy and tradition or whether you believe 19th Century discovery has somehow provided a more persuasive argument and carries greater weight. Also, like God's Problem and Jesus Interupted..he doesn't really provide alleged answers to his questions. In fact, when I read these three books...I see missing answer after answer that is no where to be found. Until he addresses contempary systematic theology and historical criticism that DOES answer these questions..
he is going to have to suffer through his own confusion...sad to say. Please pray for his restoration. God Bless. The further I get through the review the more it seems to rebut minor flaws instead of critiquing the major points Ehrman makes. For example, what seems to me to be valid comment is made in the "Uncertain analysis of variants" section of the review (basically saying Ehrman doesn't explain in detail why he thinks one manuscript is earlier or somehow better than the others), and so his reading of the texts needs more justification before it can be given weight. Fair enough (aside from that fact that all that evidence may have made the book a little dry and very large). But the broader point is missed - that getting to an "original" text is probably an insurmountable challenge: there are so many differences between texts, that we need to be scholars in textual criticism (it seems) before we can even have an informed opinion, and even then other informed scholars will still disagree with us. The main (at least, largest) section of the review entitled "Misunderstandings of Concepts of Inspiration" follows. In the response to Ehrman's "testimony" on p7, Dr Williams complains that Ehrman hasn't given evidence that we don't have access to original texts (even if any one scribe didn't). The response which immediately follows seems to go like this: (1) a few small changes shouldn't worry anyone, and (2) copying words does not mean they lose their power. Ehrman, as I read him, would reply: (1) it depends, and (2) who said they did? Dr Williams then develops (2) at length, even going as far as calling Ehrman self/human-centered (though rather delightfully as having "a rather anthropocentric condition") by suggesting, tongue in cheek, that Ehrman's position would only be satisfied by verbal inspiration of scripture directly onto printing presses. But this is a Straw Man argument. In saying "we don't have the originals" Ehrman is not saying by mere copying the inspiration was lost, but that along with copying the words were changed, and some of the words are lost. And in fact (according to Ehrman of course), a lot are lost (i.e. not just a few small changes which are "hardly going to worry anyone provided this has not occurred in the whole manuscript tradition"). The review leaves this broader issue aside and continues with comments about how "alter" and change" are used in difference senses and that Ehrman doesn't use "scripture", "text" and "Bible" consistently. Ok, whatever, but what about the knowing-what-God-says-in-the-Bible thing? The reviewer's opinion on that seems to arrive in this statement: "it is possible to maintain that in our time and place the whole original text of the New Testament is available in a relatively limited number of Greek witnesses." In other words, we, in 2010, can figure out the original text. (Or at least that we have all the data needed; it's in there somewhere.) Whilst I don't know if this is true or not (I am not a NT scholar), I don't see Ehrman's reasoning effectively refuted in the review. (OK perhaps that isn't the Dr Willaims' primary goal, but some discussion is made.) It seems highly arbitrary that we, in 2010, can decide that now. I admit it could be true. But Ehrman's argument (to which I hope not to do a disservice by boiling it down to "there are so many changes to the texts; a significant number affect the meaning of the texts") is much more compelling; I recall Occam's razor. I'd like to see a response by the reviewer to D M Higgins, August 16, 2010. I think the points made by Higgins are the critical issues that remain unanswered in this debate. This is an old post, but I would say that D. M. Higgins has not entirely understood my point. It is wrong to gloss my analysis as suggesting that we can have 100% certainty of the identity of the NT text. In many areas of history Ehrman and I might agree. We also agree that neither he or I 'know' 100% what the original wording of the NT is. We obviously differ on the significance of this fact. For me this is not very significant because the objective certainty of something simply doesn't depend on my subjective knowing it. Augustine would have been very happy to acknowledge that the wording of the original of scripture was 100% known to God, and that he couldn't find a copy of anything with 100% of that wording in his own library. That's just a traditional inerrantist approach. From the standpoint of traditional Christian theology no theologian ever expounded the doctrine of scripture such that it was necessary for any human to know 100% of the text of the NT for the doctrine of scripture to function. The original of Scripture could logically be said to be 'certain' if God were 100% certain of it. I am questioning a number of the moves Ehrman makes in his argument. One of the shifts is the one whereby the devotee of the original text has to 'prove' something original. I don't think this is necessary. Ehrman presents innovations to Christian theology (e.g. burdens of proof) and then attacks them. One can be rational in accepting or believing testimony without having to 'prove' testimony. We do this all the time. The mainstream historic Christian position has been one of accepting testimony rather than believing it can 'verify' that testimony. What can be verified is a far smaller set of things than what it is rational to believe. No one can ever verify that their mother loves them, and yet many are fully rational to believe it. I would further maintain that Ehrman has singularly failed to show that in a single occasion the original wording of the NT has been lost. Furthermore, we could also say that Ehrman indirectly shows the opposite of what his rhetoric might suggest. He brings together choice variants and tries to make a case for maximal uncertainty. However, the amount of uncertainty he actually manages to show is less even than the changes in NTs which took place between the early printing in the Reformation and 20th century NTs preferred by many evangelicals, inerrantists, etc. He culls the best examples from the tens of millions of words in NT manuscripts and can at best point to 150 deliberate theological changes, but even this number could be further reduced when you consider that (a) many of his examples are not printed as the main text in Greek NTs and (b) many of his examples are highly debatable. In other words, Ehrman, without intending to do so, does a fantastic job of showing just how little change in NT mss results from deliberate theological motivation. President of Eureka Publishing, wrote "As a Publisher of many books, including several National Best-sellers, investigating how to protect e-Books, we know we have to find ways of protecting our manuscripts - they are worth A LOT to us! So I asked our eldest son (who had 3 International Math papers published by the end of his 2nd. year at University) to do this: For every online order of an e-Book, introduce many small and a few large errors/changes/omissions into each e-book, noting the 'wheres & whats' in a database along with the person's ordering particulars - thus tying any e-book to a unique individual. Sounds like a nice idea. So every single copy would be uniquely different and we can then trace any illegal copies floating around on the Internet back to the 'guilty party' - This is actually an extreme case of what Bart Ehrman alleges happened over time with the New Testament - but in our case, it was to be purposely done! He claims that this renders the New Testament unreliable. REALLY? So Dan did the math and said" 'It's not going to work Dad - All I would need is (on average) 12 changed copies, run them through a program to compare them, and I would be able to re-construct the original MASTER-COPY of the book, without any changes in it anymore, traceable to nobody, then distribute that MASTER COPY, FREE, on the Internet - without fear of prosecution.' Still in denial I said: 'So let's make a LOT of changes, say 256 (then 512 then 1,024 etc) or more unique changes in each and every e-book ordered.' Well again Dan did the math and concluded that it was a losing battle, since it would take, on average, much less than just 256 altered copies to compare and then re-construct the ORIGINAL UNCHANGED MASTER-COPY! That's way less than the 100's of Thousands of copies of the New Testament that still exist in some form or other - some dating back to the time of the Christian founders. I asked Dan to persist - but it turns out that once a few thousand flawed, but similar, copies exist, it's mathematically very easy to reconstruct the original MASTER COPY. I gave up - now you know why my kids bought me a Wiley Coyote tee-shirt :) In other words, I'd like to confirm that it is absolutely possible to re-construct the New-Testament from the many copies still in existence, and produce the original MASTER COPY. Ehrman is NOT a Mathematician - and that clearly shows! In order to have any credibility, Ehrman's Thesis needs 100's of thousands of unique and vastly different books - an ABSOLUTE worst case scenario, the real-world chances of which (as a publisher who deals with 2nd. and 3rd. and subsequent editions often) I can assure you, in this case, are (when viewed as a mathematical 'Limit') = Nil! Put another way, you'd be well served trusting the New Testament INSTEAD of Ehrman, Hawkins, Hitchens and Harris." I do agree with Bart that the NT is not inspired by God based on the copies of the manuscripts by the scribes we have. Muslim believe in the verbal inspiration of their Book , Quran , which has been revealed to their prophet , Muhamad (PBUH). Not even a letter has been changed since the revelation. All muslims read the same text regardless to their nationality. That being said, If you don't have access to the original inspired words of Gods, it might not be easy to swallow. Here is an instructive irony or two for muslim guests. Sura 61:6 claims that a prophecy was given about the name "Ahmad" centuries before Muhammad came. Apparently God cared enough about Muhammad to send a prophecy about the name. But then God lost the prophecy, God forgot to preserve it. There is NOT ONE manuscript from before islam of such a prophecy. NOT ONE MANUSCRIPT. So did God mess-up or did Muhammad mis-represent himself? FInally, the world will be a better place when people can discuss facts and search for truth in freedom. ETC Annual Achievement Awards: More Nominations? To what extent is the Byzantine text smooth?